The Sun in reverse light. Image credit: Alan Friedman. The Sun is not a ball of (con)fusion. “In a low density plasma, localized space charge regions may build up large potential drops over distances of the order of some tens of the Debye lengths. Such regions have been called electric double layers. An electric double layer is the simplest space charge distribution that gives a potential drop in the layer and a vanishing electric field on each side of the layer. In the laboratory, double layers have been studied for half a century, but their importance in cosmic plasmas has not been generally recognized.” (Hannes Alfvén). Electric Sun theory proposes that the Sun is a positively charged electrode in a vast galactic circuit. The Sun’s negative pole is the heliosphere, billions of kilometers away, which acts like a “virtual cathode”. Double layers, so often mentioned in these pages, isolate the Sun from the Interstellar Medium (ISM). The solar wind, composed of neutral and charged particles (an electric discharge), radiates from the Sun in all directions. It travels to the edge of the Solar System at around 400 kilometers per second. Conventional ideas about heat transfer do not explain the acceleration of charged particles as they pass by the planets on their way to the heliospheric cathode. According to consensus opinions, the Sun accelerates charged particles into space in the same way that sound waves are amplified. The interior solar energy travels outward through “acoustical wave-guides,” known as magnetic flux tubes. Spicules balloon thousands of kilometers above the photosphere and carry the hot gas with them. As standard theories about the Sun propose, there is also a vast “conveyor belt” circulating solar matter down into magnetically active zones deep inside the solar interior, where it is “reenergized.” In an Electric Universe, however, the Sun is the locus of positive charge with respect to interstellar plasma. 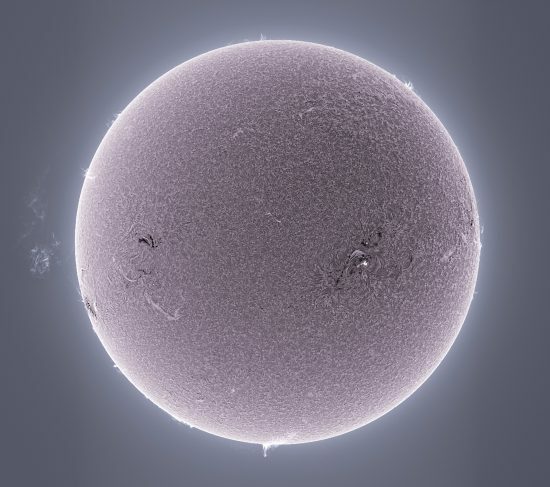 Sunspots appear when electric discharges penetrate the photosphere, allowing electric charge to flow into its depths. Electromagnetic flux tubes expose the Sun’s cooler interior. The idea of acoustic heat transfer from the core cannot be supported by any observations of the Sun. Moving charged particles are defined as an electric current, which generates electromagnetic fields. Voyagers 1 and 2 discovered electromagnetic fields constraining the heliospheric boundary into a sphere. The ISM must be electrically charged in order for that structure to exist. This observation confirms Electric Sun theory. Previous computer models of the Solar System’s boundary region were written based on the presupposition that the ISM “collides” with the solar wind as it “plows” its way through, forming a “nose” and an elongated “tail”, similar to a boat wake. Electric Universe advocates predicted the opposite effect: charged particles and the ISM’s electromagnetic field produce a spherical shape. As mentioned, the Sun’s electric field accelerates charged particles: the faster they accelerate, the stronger the field. As noted, however, the interplanetary electric field is extremely weak, but the solar wind acceleration over tens of millions of kilometers does confirm its electric field, enough to sustain a drift current back across the Solar System—sufficient to power an Electric Sun.